This reduces weight and eliminates extra cables, providing the neatest HMI unit on the market. The HEDLER DF15 does not need a fan for cooling, which makes it ideal for sound recordings. Using a special 150 W/SE Metal-Halogen lamp it produces a flicker-free light of approx. 5800 Kelvin colour temperature. Designed for professional use, the lamp has an average lifetime of approx. 6000 operating hours and the Electronic Ballast will last approx. 60,000 operating hours. The HEDLER DF15 lamp produces a continuous light output that equates a 650 Watt standard Tungsten halogen lamp! 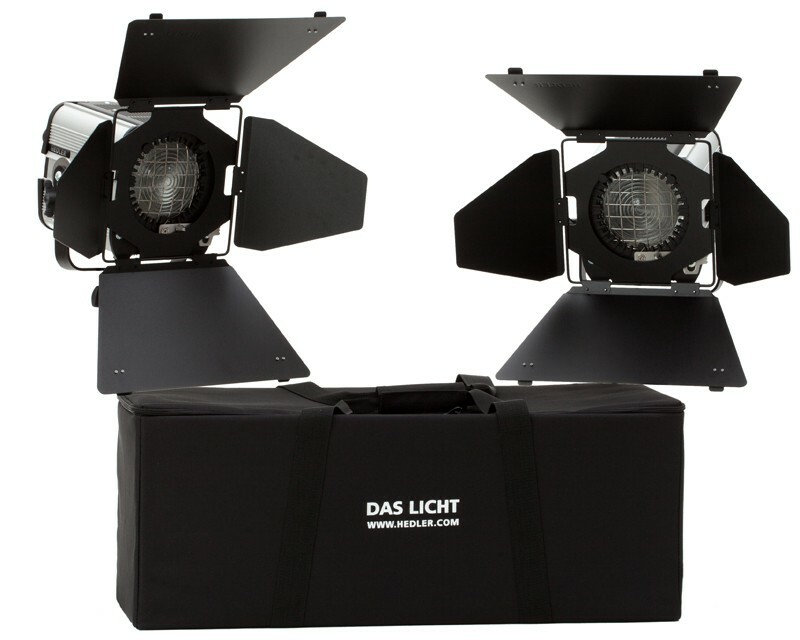 The DF15 features a Fresnel lens giving great lighting flexibility: it can be set from 12 degree spot to 65 degree flood lighting position by simply turning a knob on the back of the housing. And for those who prefer to work with Tungsten colour balanced light: a special lamp with approx. 3000 K is available for the DF 15 (like the DF 15 metal halide lamp: at a current consumption of 150 Watts it produces a continuous light output power that equates to a 650 (!) Watts standard halogen lamp). The average lifetime of this special, efficient halogen lamp is approx. 6000 hours. The DF-15 produces a light beam that creates a relatively low temperature in terms of heat, a very important feature for heat sensitive materials and humans. The HEDLER DF-15 is compatible with the vast range of light shaping accessories used by other Hedler light units: reflectors, honeycombes, softboxes, striplites, reflex umbrellas and many other accessories.